Roaches and ants are pests that get into your home even though you don’t want them inside. Commercial insecticides, sprays, and bombs contain harmful chemicals that can be harmful to you, your family, and your pets. 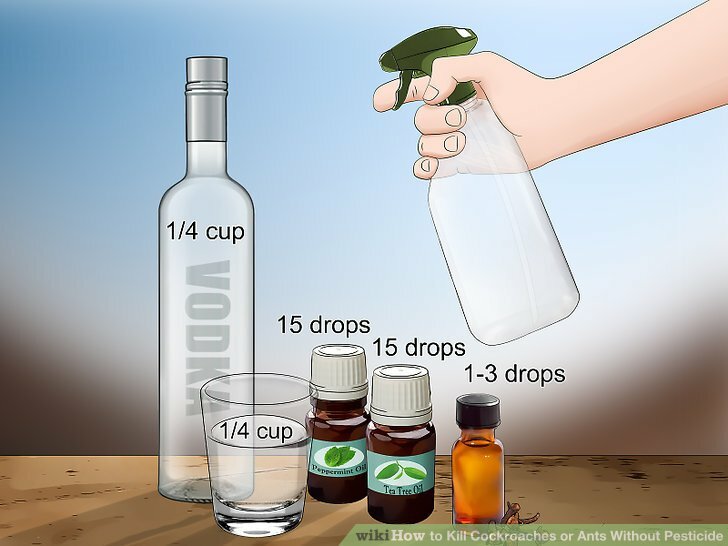 You can try to kill roaches and ants naturally by making boric acid mixtures and using essential oils. Make a boric acid and flour solution. This natural roach and ant killer is safe to place in your home and can kill these pests. The flour will attract them, and the boric acid will kill them. Wear gloves when mixing this solution. 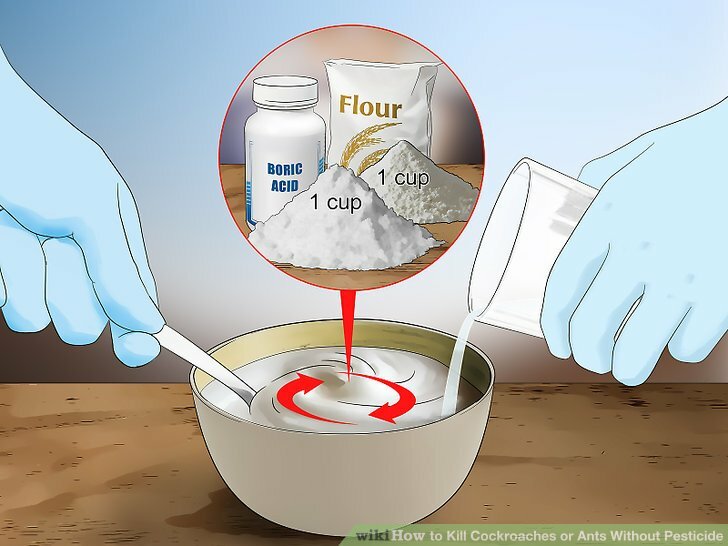 Mix one cup (120 g) of boric acid with one cup (120 g) of flour. Add enough water to make it into a liquid. Pour the solution in small containers, like bowls or jar lids. Place them around your home in places where ants and roaches will likely be, like under the refrigerator and in the back of kitchen cabinets. You can also place them around outside. You can also soak cotton balls in the solution and set them out instead. Boric acid is toxic, so keep it away from pets and children. Mix borax with powdered sugar. 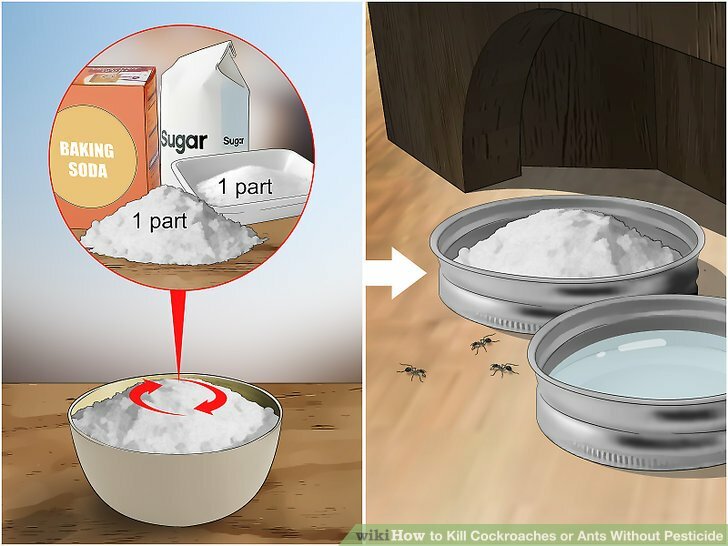 Another natural way to kill roaches and ants is to mix borax with powdered sugar. This method works in a similar way to boric acid and flour. Combine two parts borax with one part powdered sugar. Add two to three drops of peppermint essential oil to the recipe. 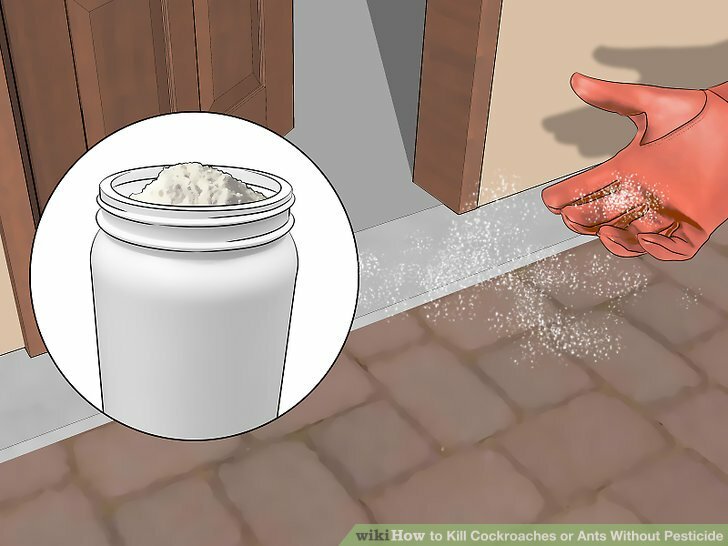 Sprinkle the mixture around the places where you have roaches or ants. You can also add water to the solution to make it liquid. Soak a cotton ball in the solution and set out around your home. 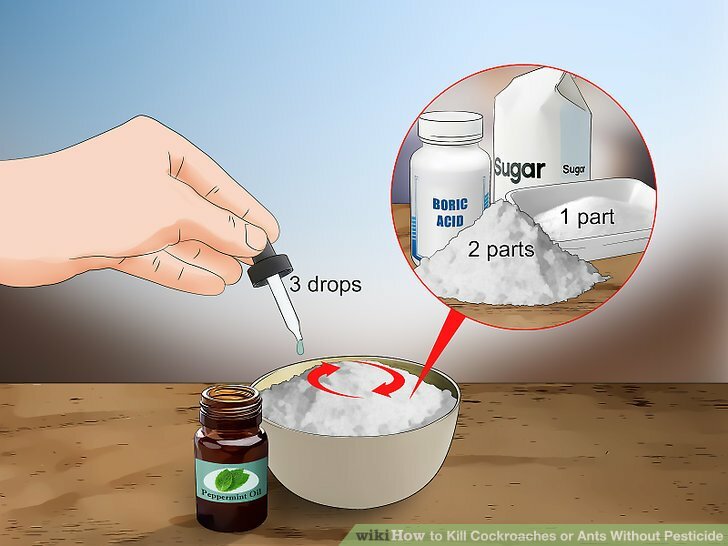 Make a boric acid trap. Take an old, clean plastic container and cut a small hole near the rim. Cut multiple holes if the trap is going to be inside, but only cut one if it is going to be outside. In a bowl, mix one cup (120 g) of borax with 1 cup (120 g) of sugar. Add water, honey, or bacon grease to make the mixture moist. Shape the mixture into balls and place them on the lid of the plastic container. Snap the bowl into place upside down. Set the trap anywhere ants or roaches will find it. Make a baking soda and sugar solution. 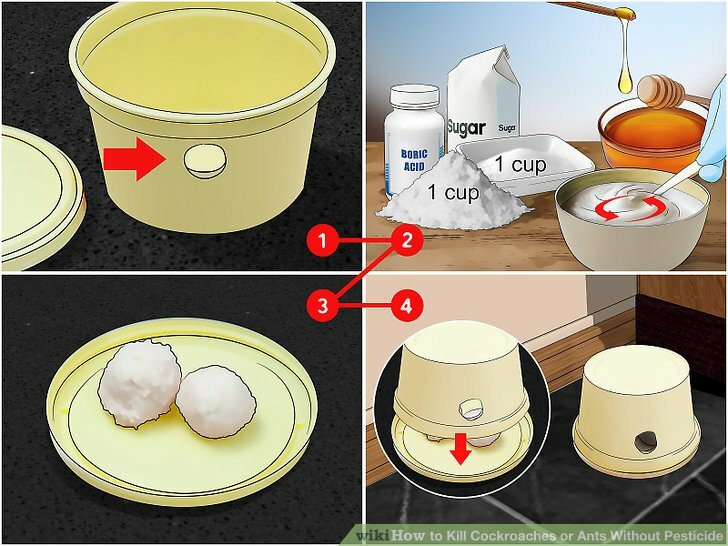 Another way to kill roaches and ants without pesticide is to use baking soda and sugar. The sugar will attract the bugs, and the baking soda will kill them. Mix one part sugar with one part baking soda. Place the mixture in small bowls or lids. Set the solution out where roaches or ants are likely to find them. You can place a source of water next to this solution since drinking water will cause the baking soda to work faster. Place the mixture under your refrigerator, in cabinets, or near entrances. Make traps with petroleum jelly. 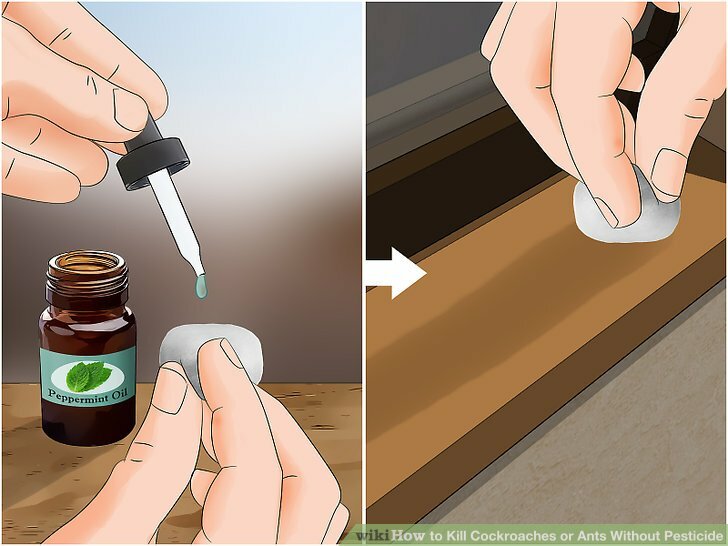 You can make homemade and nontoxic roach and ant traps with petroleum jelly. Place the jelly in a small bowl. 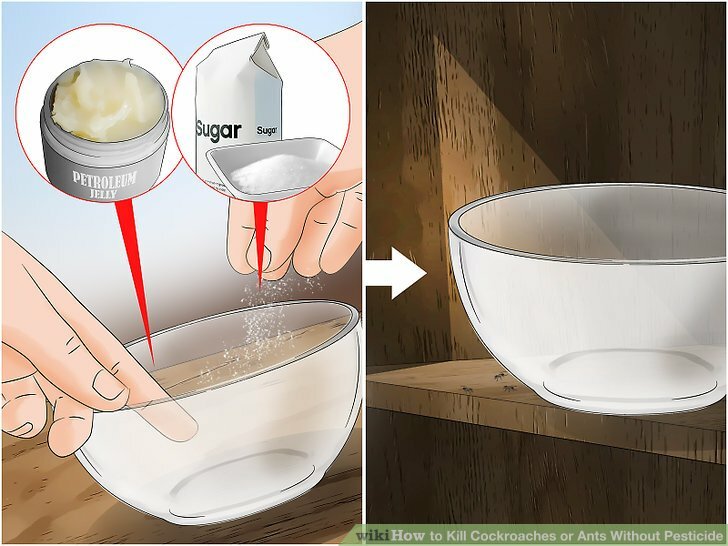 Add sugar or flour to the jelly to attract the roaches and ants. Place these bowls wherever the bugs will have access to them. With this method, you will have to go and empty the traps periodically and lay down new petroleum jelly. Some essential oils can deter ants from your home. Just choose one of these essential oils, place a few drops on a cotton ball, and wipe down any places where ants can get into your home. Try multiple essential oils if you want to make sure that the ants leave you alone. Try peppermint, tea tree, clove, lemon, or orange oil. Mix a clove oil insecticide. Clove oil works to kill both ants and roaches. It is a very strong essential oil, so mix it with other substances. Mix ¼ cup (59 mL) purified water with ¼ cup (59 mL) of vodka. Add 15 drops of peppermint essential oil, 15 drops of tea tree oil, and one to three drops of clove oil. Place the mixture into a spray bottle. 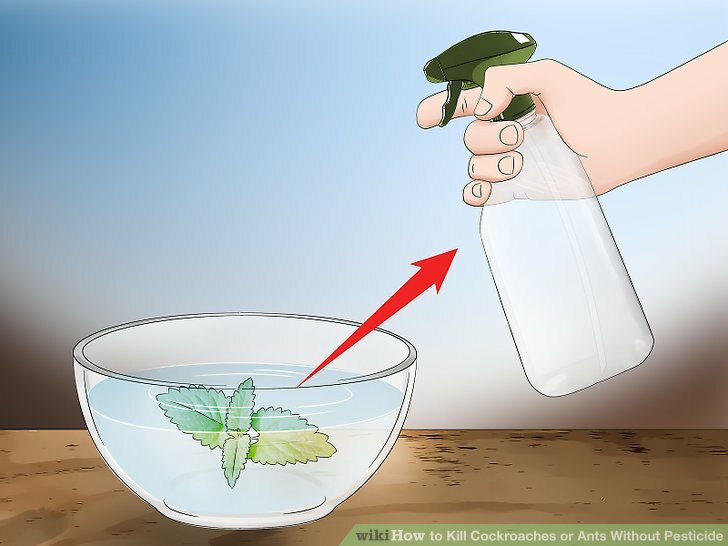 Spray the oil anywhere that you see ants or roaches. Spray around entrances to your home. Replace the tea tree oil with 15 drops of peppermint oil if you are going to spray on surfaces where you eat. Sprinkle diatomaceous earth around your home. Some people don’t like to use boric acid because it can be toxic to people. Diatomaceous earth is not toxic if ingested. 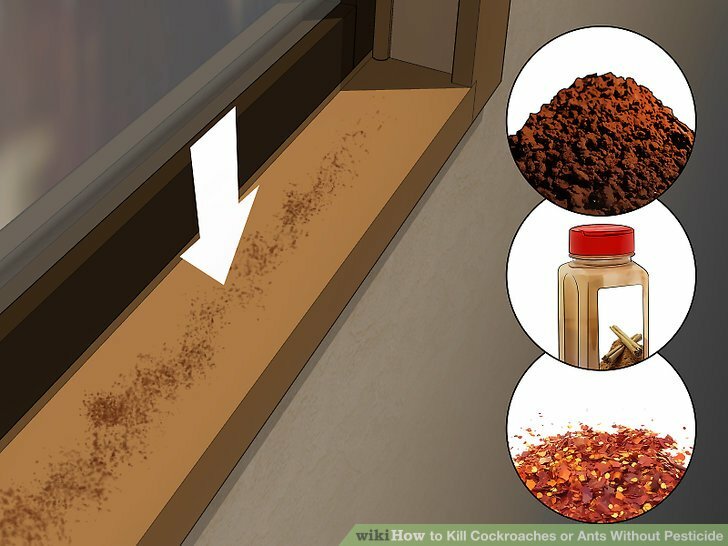 To use DE, sprinkle a thin layer of it around the entryways of your home and anywhere you think ants and roaches will be. 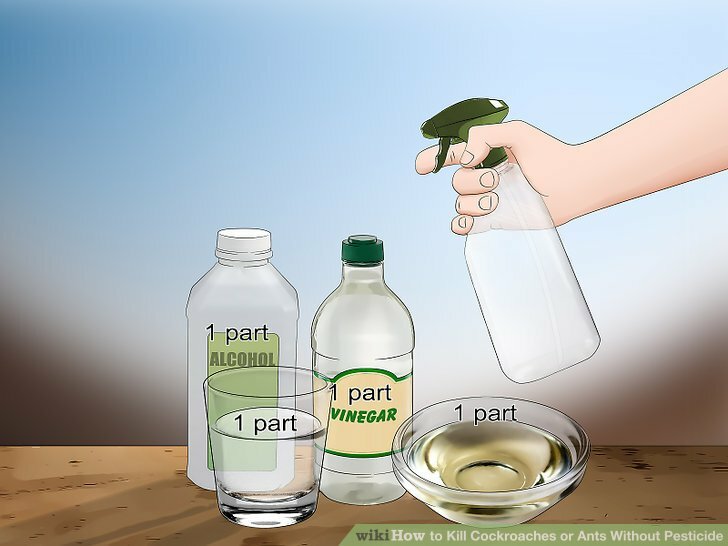 Combine one part water with one part rubbing alcohol, one part olive oil, or one part distilled white vinegar. Place it in a spray bottle. Each time you see a roach, spray them with your solution. This will coat their shell, and suffocate and kill them. Cover openings into your home with cream of tartar. Ants enter your home through cracks when they are searching for food. 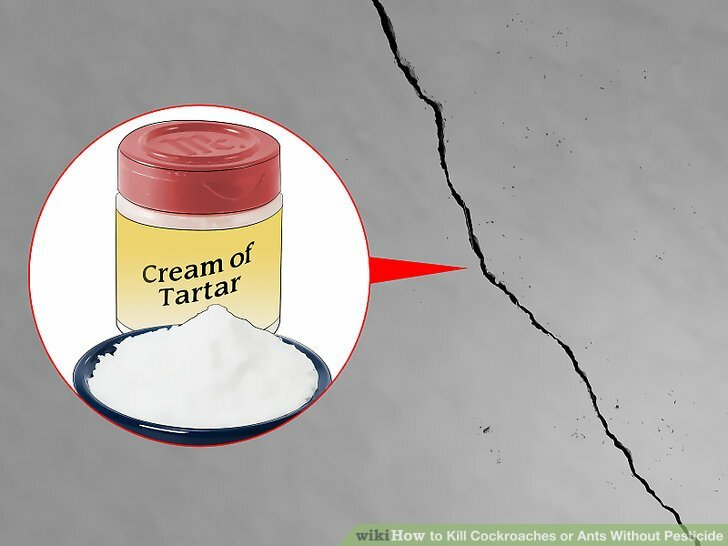 To keep them out of your home, place cream of tartar across any cracks where they can get inside. This will repel them and keep them out of your home. Place natural repellants near all entrances. Ants are repelled by many natural household items. Place these items near any entrances to your home to repel ants and keep them from invading your home. Try coffee grounds, garlic cinnamon, chili peppers, paprika, peppermint, or cloves. Lemons can also repel ants. Squeeze the juice along the entrance and place the peeling on each side of the entrance. Plant mint around your home. Ants do not like mint, so having mint around your home will help deter ants from entering. Plus, surrounding your home with mint will make it smell nice. Plant mint plants along your house’s foundation to repel ants. You can also put mint plants in pots near entrances to your home. Spread catnip around the house. 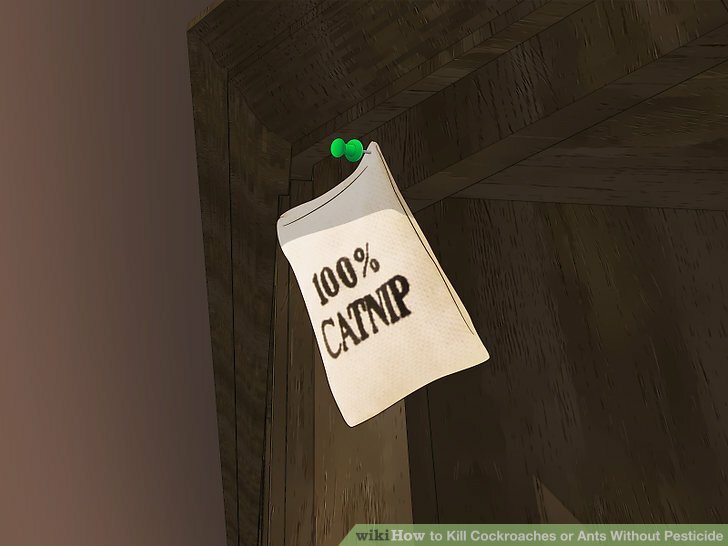 Catnip has been known to repel cockroaches. 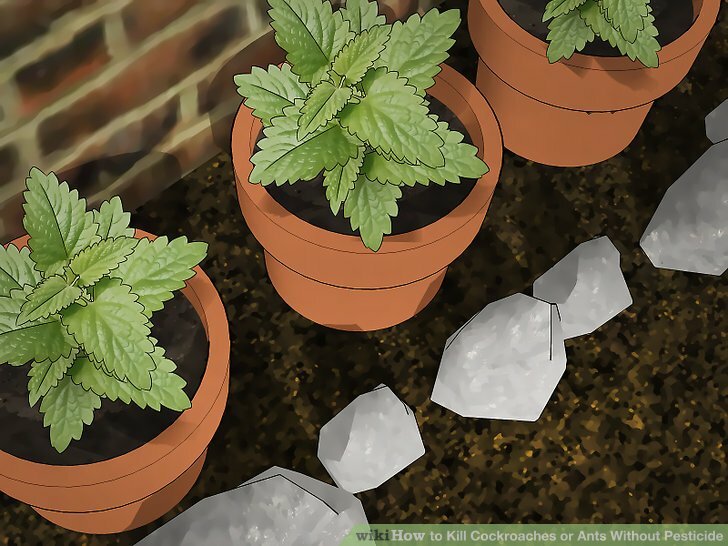 Place catnip in small bags or sachets and scatter them through your home. Make sure to place sachets up high, like on shelves, in high cabinets, and on high surfaces. Cockroaches congregate in high places. Place catnip in a small amount of water and let it simmer. Then, place this liquid in a spray bottle. Spray this catnip solution on baseboards, in cabinets, under sinks and refrigerators, and anywhere else you have seen roaches. Don’t use this spray if you have cats. Set out other natural repellants. There are a few substances cockroaches don’t like that help repel them. 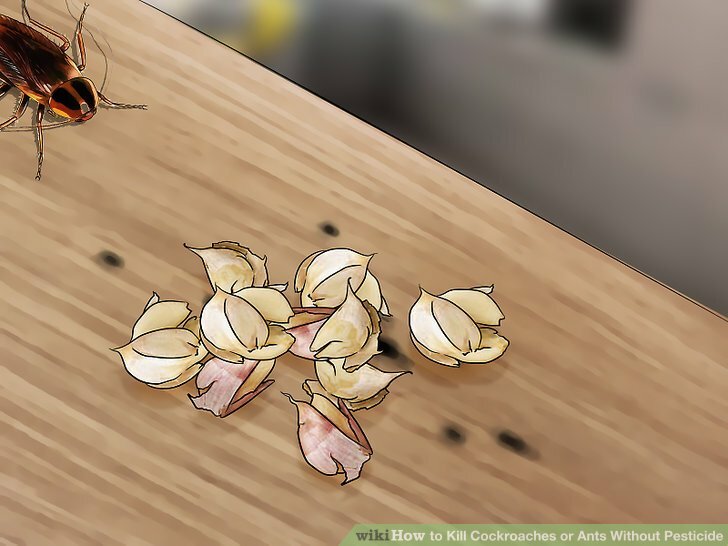 Bay leaves, cucumbers, and garlic have been found to help deter cockroaches from infesting a home. Place these items around your home to get rid of the cockroaches. Bay leaves and garlic won’t spoil easily, but cucumbers will. Make sure to place cucumbers in a place where you can remember and easily change them.